What year is my Toyota forklift? Locating Toyota forklift serial number. 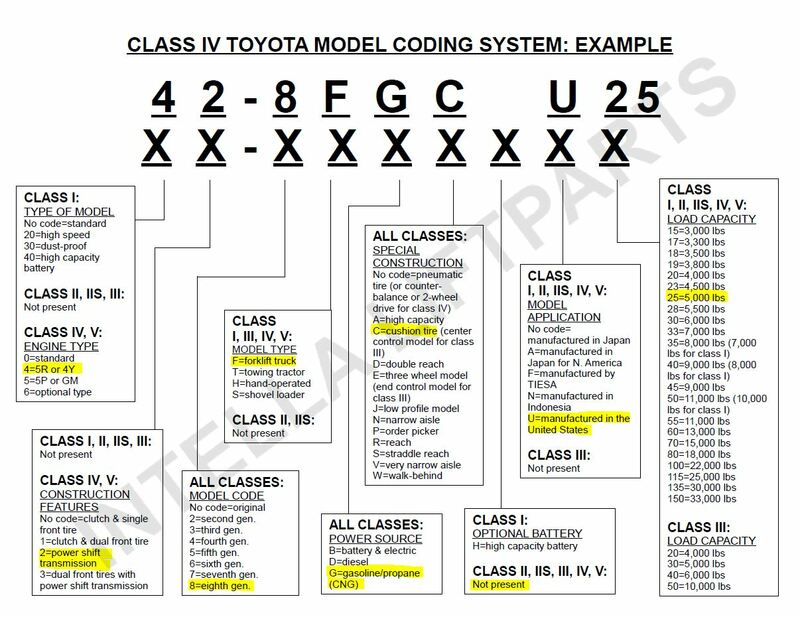 Q: How do I decode my Toyota forklift model number? A: There’s no denying it: Toyota forklift model numbers can be complicated. Each class of Toyota lift truck has a model number of a different length and is interpreted in a different way. Things can get confusing. 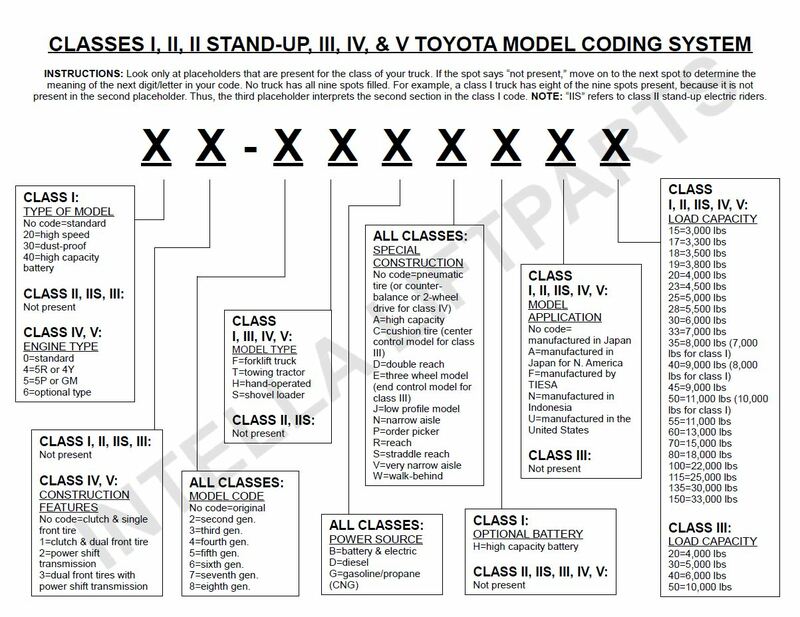 Hopefully, however, the diagrams below may help in properly reading your Toyota forklift model number. This diagram includes information for forklifts of classes I, II, II stand-up electric rider, III, IV, and V. Notice that there are nine sections on the diagram, but not all classes have information in their model numbers for each section. In these cases, the sections that are “not present” for your forklift’s class are simply skipped. To see an example of how to use the diagram, look at the second image. Click either image below to see a larger version. A PDF version of the main diagram available for download is also attached below. Below is the example of decoding a class IV forklift with model number 42-8FGCU25. CLASS WARFARE: In the forklift industry when you hear the term “class” mentioned, it may mean two different things. ITA forklift class: ITA (Industrial Truck Association) created a class system for the type of forklift. Class 1 is electric rider, class 4 is cushion sit down engine powered, etc. That’s not to be confused with carriage class. Class 3 forklift forks could fit on an ITA class 4 forklift. Confused yet? Just ask for clarification. Is the person or website referring to forklift type class or carriage class.